Have you ever had or heard about strawberry soup? Yes, this is a thing, in case you are starting to question my sanity! A yummy, refreshing, filling and full of amazing flavors thing! Perfect on hot days straight from the fridge, this chilled strawberry soup will become your new summer favorite! This delicious soup makes it so easy to eat healthy this summer! 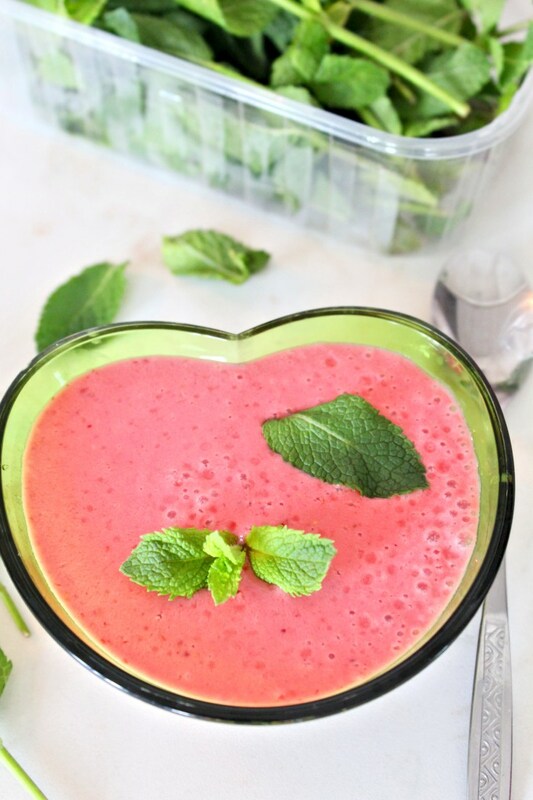 Low in calories but filling and satisfying, this strawberry soup recipe is perfect as a main dish, a dessert, appetizer or even as a post-workout snack! So easy and quick to make, this strawberry soup tastes best when served fresh, made with chilled strawberries and chilled yogurt! 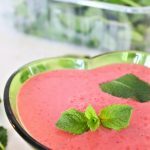 I discovered the wonders of this chilled strawberry soup when we had a surplus of strawberries and eating all that yumminess was starting to feel a little overwhelming! We thought about all kinds of different recipes to incorporate strawberries into. Strawberry soup came to mind one day when the heat waves were just too much to bare and cooking was the last thing we wanted to do. This soup proved to me the perfect lunch choice! It came together in minutes and kept us full until evening when we had a light, mainly vegetarian dinner. It’s so simple to make, looks so good in a soup plate or bowl and is a great way to trick kids into eating more fruit. To make this amazing soup you only need a handful of ingredients: fresh strawberries (best chilled), vanilla yogurt, sugar, freshly grated ginger, a pinch of ground pepper, fresh basil leaves and fresh orange juice which is optional. Also optional are the whipped cream and fresh mint leaves, for garnish. Both strawberries and yogurt are best used from the fridge and if you want to serve your soup immediately after preparing, is best to use a few frozen strawberries or frozen yogurt. All the ingredients except for the garnish will be mixed with a blender. You might need to prepare the soup in batches, depending on the size of your blender and the number of people this soup is served to. The ingredients listed below are for 4 servings. 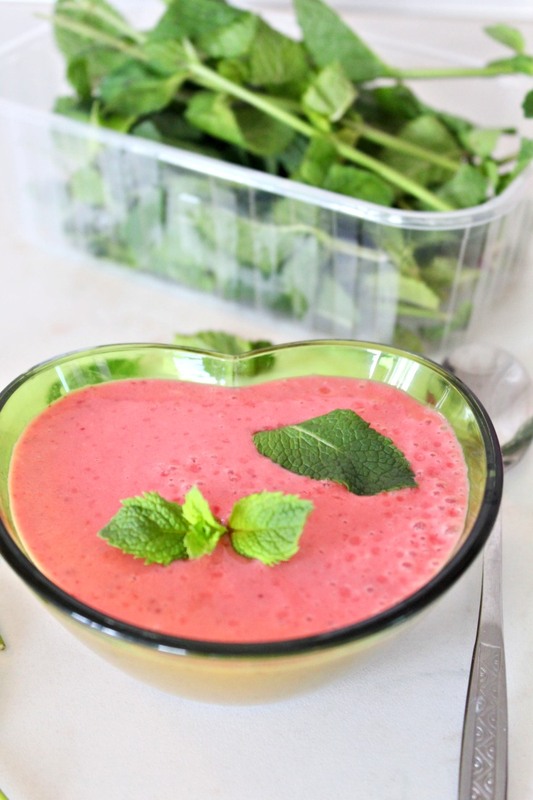 Place all ingredients in a blender, except for whipped cream and mint leaves. Blend well until everything is smooth and creamy. 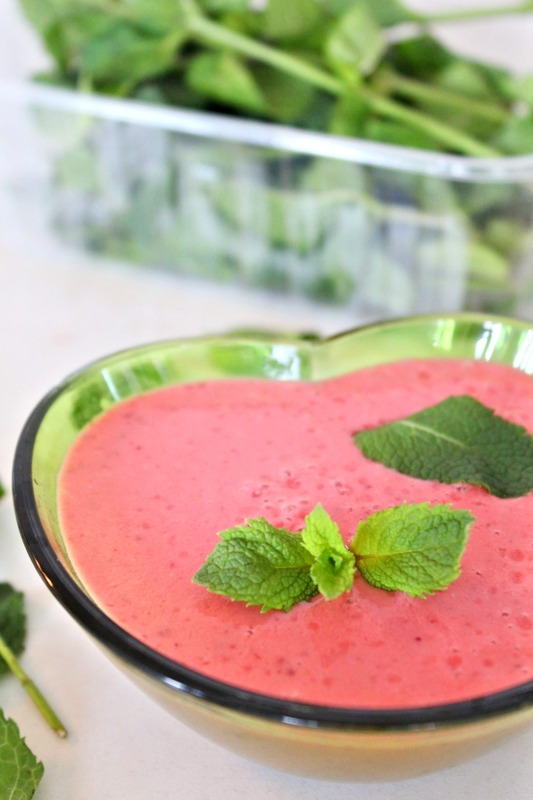 Chill in the fridge for 2 hrs before serving or serve immediately if you used frozen strawberries or yogurt.